A SEAFDEC/AQD scientific paper is a recent recipient of the Dr. Elvira O. Tan Award for 2018. The paper titled “A probiotic Bacillus strain containing amorphous poly-beta-hydroxybutyrate (PHB) stimulates the innate immune response of Penaeus monodon postlarvae” was awarded the top prize in the aquatic science category. The paper was published in the journal Fish and Shellfish Immunology. Dr. Joseph Leopoldo Q. Laranja is the principal author of the paper. Other authors include Dr. Edgar C. Amar and Ms. Mary Joy Geaga of SEAFDEC/AQD as well as Mr. Yufeng Niu, Mr. Peter De Schryver and Prof. Peter Bossier of Ghent University, Belgium. Dr. Amar, secondary author of the paper, received the award in Dr. Laranja’s stead. He also stressed the importance of preventing diseases by increasing the resistance of animals. Transmission electron micrograph of Bacillus sp. 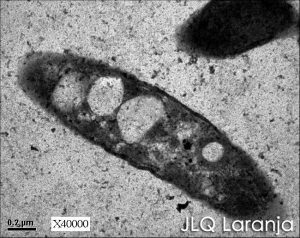 JL47 containing the intracellular amorphous PHB. Photo credit: Laranja, JLQ. 2017. Amorphous Poly-b-hydroxybutyrate (PHB) – accumulating Bacillus spp. as biocontrol agents in crustacean culture. PhD thesis, Ghent University, Belgium. The research paper discussed the potential of the probiotic strain of Bacillus sp. containing PHB to increase the resistance of the giant tiger shrimp (Penaeus monodon ) against diseases. The award was given last 22 June 2018 during awarding and recognition ceremonies of the Philippine Council for Agriculture, Aquatic and Natural Resources Research and Development at the Philippine International Convention Center, Pasay City.